I am not sure that I share his concerns. The arena of quality has a lot in common with the universe; all encompassing, immeasurable in size, and expanding for the next billion years. It is a challenge to about traditional role versus non-traditional roles for quality professionals in large part because roles and opportunities vary so much sector by sector. Take as just one example, the new growth of Quality in healthcare. Many may date the modern quality movement perhaps to the late 1890s and Frederick Taylor, and observe the advances through Shewhart around WW1 or Deming and Juran post WW2. In healthcare, the exponential growth in the notion of Quality and Patient Safety did not begin until 1999, near a hundred years later, with the awareness promoted through the Institute of Medicine and the now classic “To Err is Human”. Today Quality is the growth sector in healthcare. Where is all the growth in Malcolm Balridge; health sector. ISO 15189:2008, the ISO standard for Quality and Competence in the medical laboratory has been adopted in near 80 countries. Application of Risk Management Standards is seen through the whole of the medical equipment sector. New standards exist for health facilities. It is a Quality revolution from top to bottom. And all that change brings a ton of opportunity not only through direct care professionals, but through the network of Quality Partners. In the direct care group there are opportunities for Quality managers, Quality Team members, Implementation teams, educators and Quality research programs, Quality Assessment programs, Quality consultants. Some of these are new positions that will be filled from within the health professions, many are new skills or borrowed skills that benefit from experience beyond the “traditional”. My career as a medical qualitologist is a case in point. Over the last 30 years my career has evolved from clinician and laboratorian to one that is now full time focused within the Quality arena. Between a medical laboratory quality assessment (aka proficiency testing), and Quality educator and research and international Quality trainer, I can be immersed in Quality activities for years to come with no indications for slowing down. Introduction and implementation of a quality culture. does not happen overnight and does not happen on its own. Quality developers need to know and understand both the drivers and the tools of culture development including quality-friendly information formats and mores of information sharing (both formal and informal), awareness programs, and reward programs. Developers need to be inspirational, innovative, educational and above all approachable. Increasingly Quality is being recognized as an important part of curriculum through the preparation process. In the health professions, medical, nursing, technologist, and administration programs are all needing to find people with Quality knowledge and experience and strong communication skills. Quality is no longer just part of a business degree. We indeed have students earning Masters and PhD degrees in medical laboratory Quality, because they see a future of on-going and on-growing opportunity. Quality programs don’t just happen. They come from the input and energy and ideas that grow from knowledge and activity. In the olden days, that knowledge input came from books. Today it comes from books, and video, and courses and theatre and seminars and websites and blogs; and these don’t exist under some one takes the time and effort to create the content. In our course we talk frequently about external-internal audits. These are events where an organization sees the value and importance of the internal audit process, but see benefit to having some or all of them done by people outside the organization. E-I audits are not just certification or accreditation preparation exercises (although they may be that as well). E-I audits can be valuable training exercises as well. The Quality revolution has spawn welcome and sometimes demanding expectation both within the community of healthcare professionals and more importantly from the world-wide community at large of clients and consumers and patients. This is not the traditional business as usual, but is becoming our new-normal for a long time to come. In healthcare it is an exciting revolution in which we can all participate. Every year at this time my Clinical Microbiology Proficiency Testing (CMPT) program hosts its Annual General Meeting and I get a chance to look back over the last year. This year ww have a special meeting because it is our 30th anniversary. As much as we have stayed with our roots as a university department based PT program, over the years CMPT has certainly changed from being a small program primarily for the large laboratories in British Columbia to a whole province program, and then going regional and then pan-Canadian and finally international. We started with very basic samples with lyophilized single bacteria, and have morphed into a very different format with live closely simulated clinical and water-testing samples, plus a broad range of targets including gram stains, bacterial toxins, Antigen testing, etc. If samples are not typical of true samples, then what ever we are measuring, it is not proficiency or competency. Like most programs in North America we have had to deal with laboratory consolidation and public sector financial cutbacks, but have managed to remain active and relevant to the laboratory community and continue to be financially sustainable. Perhaps the single most important decision that we have made in the last 15 years was our commitment to structure ourselves around a Quality Management model. That decision has had some consequences especially around the consumption of time and energy and money, and it has not generated much interest within the university department, and so it is important for me to regularly review and reflect upon whether I have put us upon the right path. I imagine that we could have reached the same point of success had we not focused on ISO 9001 as a road map, but I doubt it. I suspect we never would have been able to sustain our integral practices. Every year we look at our policy base and reinforce or refine it and use it as our foundation for action going forward. Having the policy base available has actually made making decisions on go-forward plans much easier. Indeed when we were really getting hammered by consolidation and a dropping Canadian dollar (down to 62 cents at one time), our policies with respect to staffing and financial responsibilities made a lot of decisions about what is and what is not important much easier. Today the policy set is very encompassing, but even in the last 3 months we were faced with some issues with respect to succession planning, and we found that while we had some broad and basic ideas, we had no policies or formalized plans. That became a reason to reflect more broadly, and now we have a documented policies, and have been able to create a strategy and plan. Good for us. We have a regular process of internal audit that looks at the organization from both a technical and management perspective, and we can count how many times it has “saved-our-bacon” over the years. It is amazing how often small weaknesses creep in. Sometimes they reach to point of manifested errors which I think we pick up quicker because of the audit. More often we pick up potential problems before they erupt and we get to make changes before the bad thing happens. Every year we identify around 8 OFIs, the majority through the internal audit process. We focus a lot of time on customer satisfaction. We monitor opinion and suggestions through surveys, and we monitor concerns, complaints, appeals and resolutions. We have become very adept at gathering information and have developed very successful survey models that I see many others would benefit from. [How often do you click out of an electronic survey because it is too long and too boring?] And we make a lot of decisions based on the information. Many of our most innovative changes, including product improvements, new products, and new programs have arisen from this information. Every year I take the time to review all our reports in all aspects of our program, including our annual goals and objectives. It takes me a few days. It lets me know if we are staying on track or doing what most organizations do… good ideas, good plans, no follow-through. I know with confidence that nearly 90 percent of annual goals are met within a year, the about 90 percent of the remaining are met within the next year. Over the last 10 years we have failed to meet only one of our established goals, and that one we have put on hold and on a new time table. Overall with all the pressures that come from being a small education oriented self sustaining university based program, I suspect that had we not got serious about our management model, the most likely outcome is that we would have disappeared years ago. That we are still active and thriving and providing creative and innovative education, research and outreach because of our QM model. We might have been able to get into a process of internal audit or management review on our own. We never would have figured out monitoring of customer satisfaction. From my perspective our success and sustainability is directly related to our commitment to Quality Management. So to address the question “is Quality Management window-dressing?” for me the answer is simple and direct. Absolutely. But more importantly it is also the window, and the wall, and the foundation, and the whole darn house. Yesterday I had the opportunity to give a presentation at the National Society for Histotechnologists at their Annual Meeting in Vancouver. This was the second time that NSH as met in Canada. This was a good time to have a meeting in Vancouver. I don’t know what is and what is not a manifestation of climate change, but this has been one magnificent late summer and fall in British Columbia. The meeting had by my estimate maybe 700 attendees (?) with a nice group attending my presentation on Costs of Poor Quality with a focus on TEEM impact factors. If you have visited here before, TEEM describes the impacts and consequences of error in terms of Time, Effort, Energy and Money, where effort describes physical strain and Energy describes mental stress. This was my first oral presentation on the concept of TEEM impact on Quality. It describes the impacts of Effort and Energy on medical laboratory error. I started with the argument that most laboratory errors are the result of slips and distractions, and sometimes poor judgements. But these don’t just happen in a vacuum. 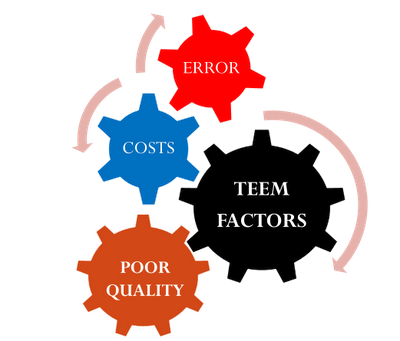 Sometimes, stressing and straining systems factors like noise and crowding and workflow increase the likelihood of error. In addition, I drew on the literature from laboratory safety. An old and small but very insightful study by G. Briggs Phillips on the human factors associated with laboratory accidents [ see: Laboratory Safety: Principles and Practices, published by ASM Press in 1986] pointed out that attitude and situation impact the risk of error and accidents significantly. My central point was that underlying factors that cause stress and strain can increase the likelihood of error that gets described as a human foible or slip, but slips often increase the level of stress and strain which in turn increases the risk of error. What I have added is some scales that can (once validated) be used as measures of stress and strain, that the astute manager will be able to apply as an indicator of rising risk for error. Brilliant? ; no. Inventive? ; no. But I think it has the potential of being a good example of an innovative tool for Quality and Risk managers. I have re-activated my Twitter ® account. @Qualitology for a number of reasons which I will explain later.